You Know that Whole Cyber Monday Thing? I avoid shopping on Thanksgiving weekend like the plague. I’d rather stay home and fluff my carpet or something. Now, if you told me that shopping consisted of a small town atmosphere, with main street shops bedecked in Christmas lights, with carolers in Victorian garb dotting the street corners, with toys in the shop windows – something rather Norman Rockwellian or Charles Dickensian – ok, sure. I’d be on board. But…shopping centers? Crowded parking lots? Oh golly. No. But I admire the tenacity of those who can not only handle it, but who really have a blast doing it! Still, when it comes to Cyber Monday, I don’t mind joining in a bit and getting somewhat gimmicky … I’ll tell you why. 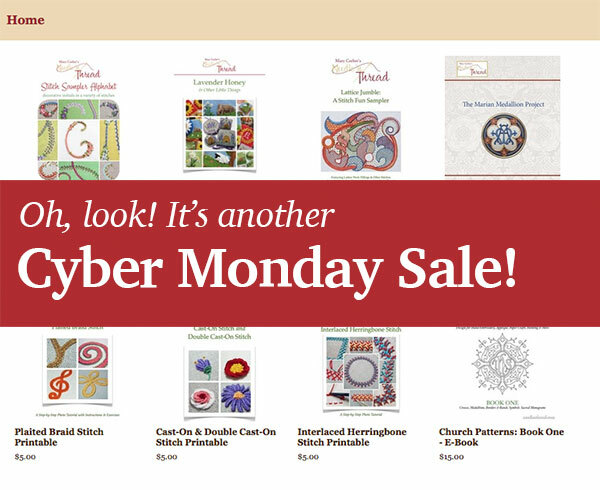 So, jumping on the Cyber Monday bandwagon here, all the e-books in the Needle ‘n Thread shop are 15% off today and tomorrow. If you had any of them on your Christmas wish list, now’s the time to pick them up! Did you know you can also gift any of my e-books in a really easy and fun way, which I mentioned in this article last year? There are all kinds of adorable sewing-related USB drives on the market – it’s just a matter of downloading the PDF e-books to your own computer and dropping them on a USB drive, to give as a gift. So, I cave to the Cyber Monday sales gimmick for a few reasons. The first is that I’ve gained quite a few readers here on Needle ‘n Thread during the last half of this year, and some of you might not know that I offer some fun e-books in my shop. I figured this would be a good way to let you know! Another reason, because several of you told me you have the Stitch Sampler Alphabet book on your Christmas wish list. This gives you an opportunity to pick it up for a little less. Another reason – if you’re wanting to make any Christmas ornaments this year, the Lavender Honey book has all kinds of ideas for finishing, that work well as ornaments. And yet another reason? Those of you having Embroidery Guild Parties this season might be searching high and low for a good gift to take for gift exchanges and the like. E-books on a snazzy USB drive would be a fun gift! …and besides, it’s what all sales in any industry boil down to, right? …to put it bluntly, it’s my last opportunity this year to make any income. After all, that’s why we sell things. And that’s why we sell things on sale! Buying my e-books helps support Needle ‘n Thread. It literally keeps the website going. So, if you’d like to take advantage of a little break in cost and there’s an embroidery e-book in my shop that sparks your interest, today’s the day to do it! If you have stitching friends and you have the opportunity, don’t be shy about sharing the sale with your buddies, too! Oh, let’s see – there’s a tips and tutorials article coming up, just in time for some relaxing weekend stitching. And I have some project progress for you! I’ve had the opportunity to do some reading lately, so I’ll show you what I’ve been reading, and I’m working on some really little things, just for kicks, and I’ll show those to you, too. Have a terrific Monday! I’ll see you on Wednesday with some tips and a tutorial. If you want to talk to someone about what you are going through. I am a 3 year breast cancer survivor had to do the chemo and radiation thing. Was just diagnosed again had the surgery and am waiting to find out about chemo this time around. I might be able to tell you some tricks to make it a little easier on you. It’s sooooooooooooo nice to have you back again, I hope you are feeling well. I agree with you about cyber sales. What a great idea for Christmas to buy all your lovely ebooks as Christmas presents, especially with the discount, they would make great presents. I can’t wait for the tutorial articles and look forward to what you have been reading and the little things, oh free patterns always look forward to those. Thanks for sharing your news on what you have been up to and for the up and coming embroidery items. Hear from you soon. Thanks for the reminder Mary. I ordered the Medallion project and Church Pattern books. I may not have the skill for them all but I will enjoy reading! Plus I want to make a prayer book cover one day. I’d just mentioned your books on my blog, this weekend, in the hope that it might get you an extra sale or two – and now anyone who looks has an added incentive. That’s perfect timing! When I download a book, does it become printable? I do so much better with print than screen… and does it stay on my computer forever? Or does an e-book disappear? Hi, Jean – once you’ve downloaded the PDF file to your computer, it’s there to use whenever you need it, and yes, it’s printable. That’s the nice thing about a PDF – it prints as is, formatted correctly. You can also pick and choose which pages you want to print, if you don’t want to print the whole thing. Hope that helps! Thanks for the cyber Monday sale. I have all of your publications now, except for the church patterns which are not really in my wheelhouse. But I loved your other e-books. I’ve made the darling little bee hive needle case and I am hoping to get started on some of the other projects soon. I am not sure that I will ever do the Marian Medallion Project but I know I will learn a lot just reading through the book. And I would like to try working at least some parts of the piece…. I hope that you are feeling well and getting over your recent surgery. I send my best wishes. Hi Mary, Hope you are feeling better, lately. Please keep us informed of your progress. The Plaited Braid book is the one I ordered some time ago and have yet to start on it! (Just lack of time) But I have a request, though, Mary, for a new book! I have a grandchild who started embroidering 2 years ago, who could use some guidance. Would you put together a beginners project that uses elementary stitches at maybe 3 different stitches per project? I’d love to get her more involved in the craft. Oh! A gradus ad parnassum by Mary Corbet. That would be fantastic! Best wishes for a full and speedy recovery, Mary. So nice to see this post, Mary! I hope and pray everything went well and you are on the recovery road. Thanks for the Cyber Monday shopping opportunities. Black Friday was a retail term that was not public until recently. It was never intended to be a day for major sales or to take away part of Thanksgiving. In 1863 Abraham Lincoln signed a law establishing Thanksgiving Day as the last Thursday in November. Prior to this, with the exception of the Thanksgiving Day declared by George Washington (a one time event) Thanksgiving Day was generally declared by the individual states and varied greatly in when or if it was observed. One it was established on a fixed date (ignored in Southern states until some time after the US Civil War of course), the day after became an unofficial start to the Christmas season. As people started shopping on this day and it became more and more common, many merchants would offer sales (not the “door buster” ones one sees these days, but small sales). At this time it was still just “the day after Thanksgiving”. As more and more purchases were made many stores noticed that this was the day that they finally started making a profit for the year – turning the red ink (loss) on the ledgers to black (profit). This is where the term comes from. It only dates back to the late 1800’s or early 1900’s. It became so significant to merchants that when in 1939 the country was finally getting out of the Depression and Thanksgiving Day fell so late in the month that it was on the last day of the month, the merchants were frantic at the greatly abbreviated shopping period as no one would dream of shopping for Christmas before Thanksgiving and they had a week less to make their holiday sales. FDR changed the date of Thanksgiving to the 4th Thursday in November where it has stayed since. Black Friday – even before we had huge sales offered in its name – used to be the busiest shopping day of the year. Now the Saturday before Christmas generally has this honor. The term came into general use for the public late in the 20th century as news shows would use the term and then stores started using it for their day after Thanksgiving sales. Cyber Monday came into being because when people started buying items online in serious number of sales, it was noticed that when people returned to work on the Monday after Thanksgiving – in those days the more common place to have high speed Internet access as opposed to at home – the number of online sales spiked like crazy. It started being called Cyber Monday by the media and went from there. Since smaller, local stores cannot afford the blow out Black Friday sales of large stores, American Express came up with the idea of having Small Business Saturday – originally intended to benefit those small stores which accepted American Express cards, but again expanded since. Hi, Nancy – I think that has to do with your browser settings. If you have pop ups blocked, for example, it might not work. If you have the option to use a different browser, it might work better. If not, you’ll want to change some of your settings on your browser, and then try it. You can change the settings back afterwards. Feel free to email me if you have any further problems, if you like! Mary, I’m in college classes for handwork. I can’t thank you enough for all the help you’ve given me. So, I bought an e-book! Whenever I get stuck with my assignments, I turn to your blog for the help I really need. Many times our professors forget to mention the simple things like WHAT TYPE OF THREAD does this use! Note the yelling and stressing are all mine. And, get well soon. We need you! Next Next post: When You Care Enough – Embroider Your Cards!